Cleaning your home without harmful chemicals. Most people have no idea what goes into the products they use to clean their homes. A short study of the industries from which the most common household cleaners come will leave the average person with grave doubts about the safety of the chemicals used in their home. The unknown long-term effects of widely-used chemicals may seem unavoidable to some, but there are alternatives to using the products on store shelves. Among your options are that you can make your own cleaners. Not only will these cleaners be safer, they will lack many of the harsh allergy-exacerbating ingredients found in commercial products. If you want to make your own cleaners, where do you start? Matt and Betsy Jabs‘ DIY Natural Household Cleaners: How to Make Your Own Cleaners Naturally has in it many recipes that will help you to create healthy cleaners using basic household products. Note the “DIY” in the title, as self-reliance is one of the many benefits of making your own cleaning products. Aside from health benefits, the book also points out several other reasons for making your own cleaners, including to give as gifts. Your family and friends may appreciate the effort put into hand-made presents. Making your own cleaners can also be an activity in which the whole family can participate. 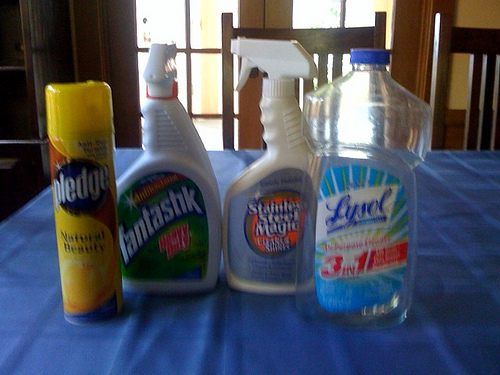 The cleaning products may be made with ingredients that cost considerably less than those sold in stores. Among the ingredients used in many of the recipes are baking soda, white vinegar and washing soda. To add pleasant scents to your cleaners, you can add essential oils such as lemon, bergamot and lavender. The book contains recipes and instructions for mixing everything from your own dishwashing soap and window cleaner to fabric softener and laundry detergent.